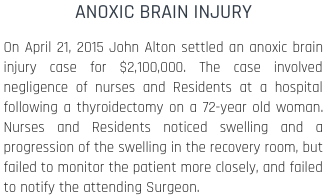 At The Law Offices of John M Alton Co, LPA, I help victims recover for past, present and future medical bills, lost income, pain and suffering, disability, emotional distress and more. If your injury required extensive or ongoing medical care, or left you unable to work or seriously hurt, our goal is the same. I want to help you recover from your pain and suffering. The Law Offices of John M Alton Co, LPA represents construction accident victims in Columbus, and throughout the surrounding areas. I have nearly 25 years of experience in the multiple practice area of the law. Allow me the opportunity to serve your interests and resolve your construction accident case now. When you need to recover medical expenses, lost wages, and other expenses necessary to protect your future security and care, you need to contact an advocate who is dedicated to protecting your rights. The Law Offices of John M Alton Co, LPA is here to protect your rights, your assets, and your emotional well-being during your recovery. Your construction accident matter needs to be resolved with results. You deserve to be treated fairly and receive compensation from the negligent party. I will help you achieve that goal with results. 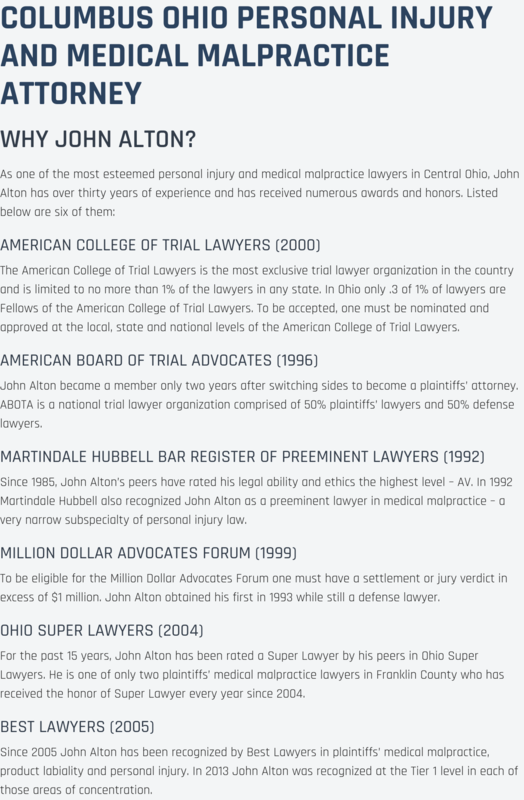 The Law Offices of John M Alton Co, LPA will do everything possible to put our nearly 25 years of legal experience and knowledge to work to your advantage. My representation on your construction accident case will help guide you during one of the most challenging times of your life. I understand how difficult it can be for you to have been in an accident due to another person’s negligence. 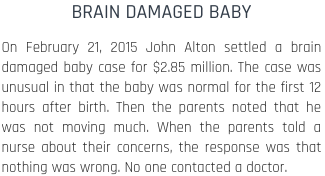 The Law Offices of John M Alton Co, LPA is dedicated to helping you get through this challenging process with as little difficulty as possible. The Law Offices of John M Alton Co, LPA is ready to work with you today! We provide our construction accident legal advice to anyone who is facing hard times in Columbus. For those who prefer face to face meetings, we invite you to visit our offices located at 1071 S. High Street, or if you pref3er a simpler mehtod of communication we invite you to give us a call at (614) 221-6751 and learn more about what we can do for you.